According to climate change enthusiasts, warming temperatures are melting the arctic ice, reducing the habitat of the polar bears and causing a decline in their numbers. 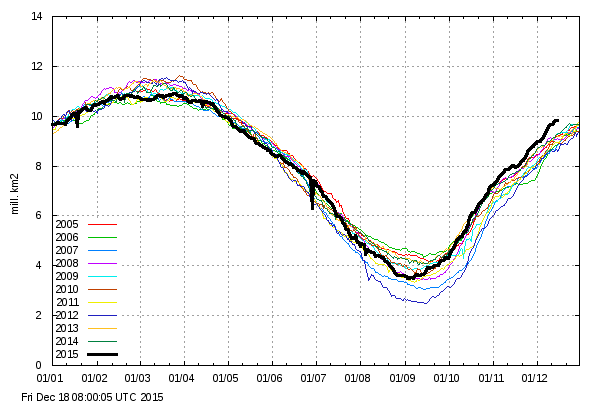 There are only two problems with this claim: the arctic ice cap is growing, and so is the polar bear population. 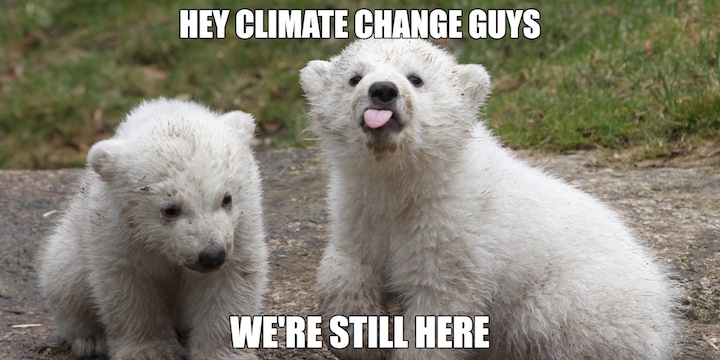 If they checked out the science rather than listen to the idle warnings of the climate change community, Polar Bear International would feel much better about the future of their furry white friends. Based on the graph below, dated 12/18/15 and published on the Real Science blog, but created by the Danish Meteorological Institute (which is run by the Danish Government), the Arctic sea ice extent (the area of the sea covered by ice) this year is larger than it's been since 2004. Additionally, University of Alabama Huntsville satellite data for November (the latest of their monthly releases) reveal that temperatures in the northern hemisphere have shown a zero or negative trend (defined as from zero increase to an increase at a rate of less than .01 degrees centigrade in a century). Results of this fall’s Barents Sea population survey have been released by the Norwegian Polar Institute and they are phenomenal: despite several years with poor ice conditions, there are more bears now (~975) than there were in 2004 (~685) around Svalbard (a 30% increase) and the bears were in good condition. Interestingly, tracking the world-wide population of polar bears has been difficult because the International Union for Conservation of Nature (IUC), which provides the "official numbers," changed their method of reporting in 2015 after years of increases. The change makes demonstrating a trend up or down impossible. The site Polar Bear Science, which has been reporting the IUC numbers, believes the reason for the methodology change was to hide increases in the polar bear population. Even so, based on the local data and what's been known through May of 2015, it looks as though the bear population is up.